These South American Brazilian Chicken Coxinhas | Croquettes differ from those in other countries, as the coating is made with stock leftover from cooking the protein filling that’s incorporated with flour, salt and fat and cooked together, much like a pâte à choux (a dough used to make sweet cream puffs, éclairs and savory cheesy gougères). 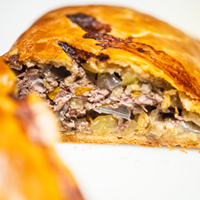 The fillings can change depending on your craving and the available beers, but the techniques are all here. When I was in Rio de Janeiro last year, I ate at a wonderful Brazilian restaurant called Aconchego Carioca. 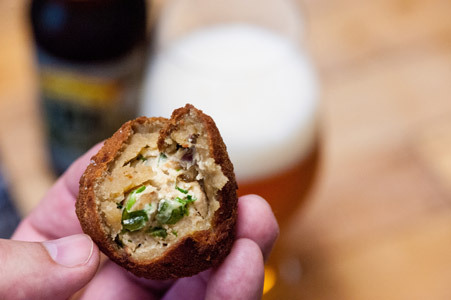 Among the many amazing dishes we consumed, paired with a huge selection of beer from South American craft breweries, was an appetizer called Coxinhas, a Brazilian chicken croquettes. 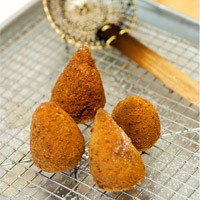 Filled with poached chicken, shredded and mixed with cream cheese, these croquettes are formed into a small fig or chicken leg shape, breaded and fried. Talk about the perfect bar snack! 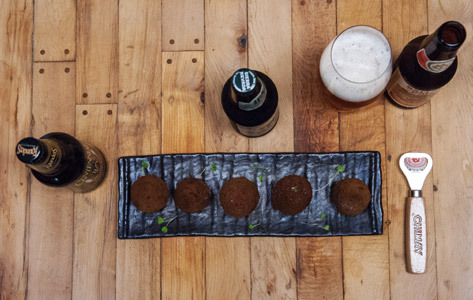 This is my Beer Cuisine version, using Brown Ale to reinforce the flavors produced by the Maillard reactions in malted barley, the browning of the chicken and the sautéed vegetables, adding extra depth of flavor into these bite-size treats. 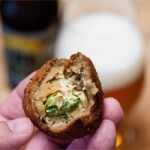 This croquette this filled with a shredded chicken that was poached in brown ale and mixed with cream cheese and chilies, then stuffed into a dough made with the chicken poaching liquid, breaded and fried. Add oil to a large skillet or Dutch oven, placed over medium-high heat. Season the chicken thighs on each side with salt and pepper. Place the thighs in the skillet, skin side down, spacing them so they aren’t touching. Cook for 5 – 7 minutes, rendering out the fat and browning the skin to a nice golden brown color. Flip the thighs and cook another 5 – 7 minutes. When the chicken thighs have browned on both sides, put them in a bowl and pour the fat (schmaltz) into a ramekin or other container. While the chicken cooks, prepare the rest of the ingredients. 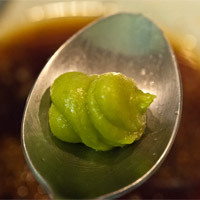 Next, measure out 2 tablespoons of the fat and add it back to the pan, reserving the remaining schmaltz for other uses. With the pan still over medium high heat, add the prepared celery, garlic, carrot, bay leaf, onion, parsley, leek tops and oregano, sautéing for 7 – 9 minutes, until the vegetables start to brown. Deglaze the pan with the Brown Ale and use a spatula to scrape the pan, removing any of the fond (cooked brown spots) on the bottom of the pan. Add the chicken thighs back into the pan and add the water, making sure the poultry is fully covered. Once the liquid is boiling, turn the heat to low, cover, and let the chicken poach for about an hour. When the chicken is fully cooked, remove it to a bowl and cool for about 20 minutes. Strain the remaining cooking liquid, which has become a stock, into a measuring cup. You want 3 cups of stock altogether. If you have more, add it back into the pan and reduce until you have that amount. Save this stock for the croquette dough. When the thighs are cool enough to handle, remove the skin and shred or finely chop the chicken into small pieces, discarding the bone and any cartilage. 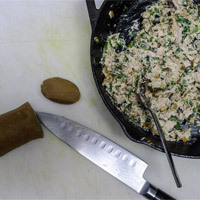 Add the cream cheese to the warm chicken and set aside. In a saucepan placed over medium-high heat, add the butter and sauté the onion until lightly caramelized, about 10 minutes. Add the garlic and cook for another minute, then add the prepared pasilla pepper and cook one minute more. Pour the onion and pepper mixture on top of the cream cheese and add a few pinches of salt and pepper, hot sauce and cilantro. Using a spatula, combine all the ingredients. 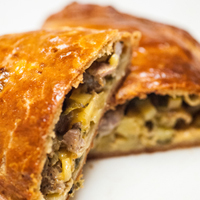 Set aside for an hour, allowing the filling to cool. While the filling cools, place a medium sized pan over medium heat. 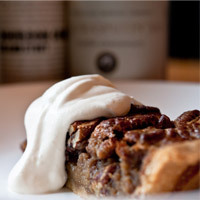 Add the 3 cups of reserved Brown Ale stock, flour, salt and schmaltz (or oil), whisking together to form a thick dough. 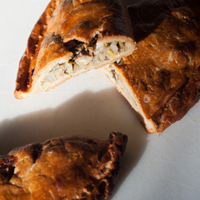 Using a spatula, fold and stir the dough for about 3 minutes, stirring consistently, to prevent it from scorching. Transfer the dough to a lightly floured surface and using rubber gloves, knead it for a minute. Then, roll it into a log the diameter of a rolling pin. Cover with plastic wrap and let the dough rest for an hour to cool and set. 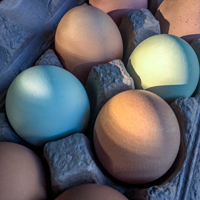 Cut the dough into 3/4-inch thick pieces and roll them into spheres about the size of a ping-pong ball. Press your thumb into the middle of the ball and rotate it, pressing it around your palm to create a bowl shape with an even thickness of about 1/10 inch (3 mm). 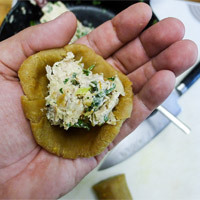 Scoop in a tablespoon of the filling and bring your fingertips together, cupping the dough around the filling. 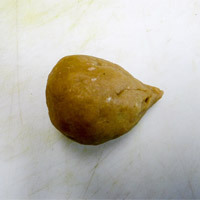 Pinch the dough together until the balls are sealed and the top has a little bit more dough. 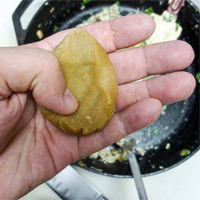 Shape it into a fig-shaped finished croquette. Repeat with the remaining dough and filling. Next, whisk the eggs together with the salt and set aside. Place a bowl with the bread crumbs next to it. 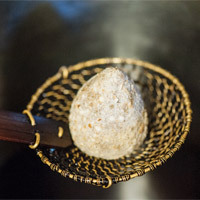 Dip a croquette in the egg wash, coating it on all sides and letting any excess drip back into the bowl. 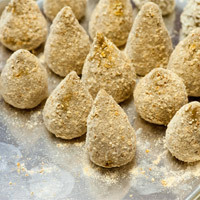 Then, roll it in the bread crumbs, pressing gently to make an even layer while maintaining its fig shape. Set onto a sheet tray and repeat. Once finished, wrap the tray with plastic wrap and refrigerate for 2 hours or overnight, or freeze overnight and then place into a freezer bag for up to 3 months. Heat oil in a fryer or large, wide pot to 350°F | 177°C. 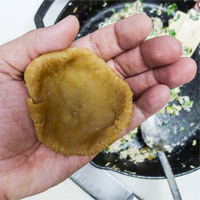 Fry three coxinhas at a time for 4 – 5 minutes or until the crust is golden brown and they float. Remove from the oil with a skimmer, place on a rack over paper towels and serve immediately. I like a citrus-forward IPA, Witbier or Kölsch to cut through the fat of the crust and the cream cheese filling. An IPA will also enhance the light heat of the pasilla pepper and the hot sauce.